Happy July everyone! 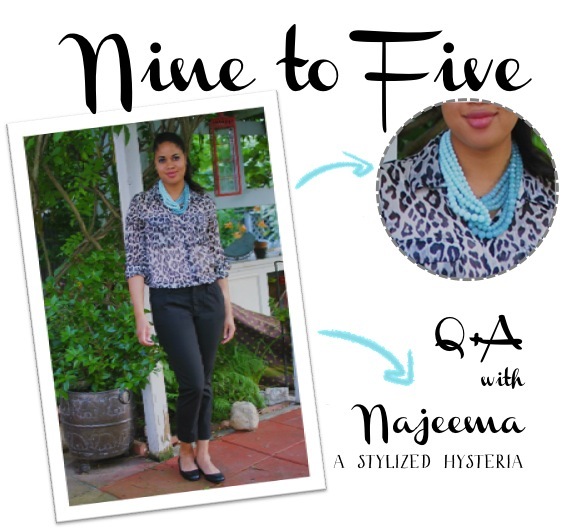 I'm super excited to bring you Najeema from A Stylized Hysteria as this week's Nine to Five blogger. I met Najeema about a year ago and was immediately smitten with her style and her love of animals. Since then, she's been inspiring me with her fashion choices and her kindness. Make sure you check out Shannon's blog for information on where to find these gems! I work at a really small non-profit that advocates for policy reform. So some days, I'm behind a computer all day and I can pretty much wear what I want (think jeans and spiked sandals). But on other days I'm meeting legislators at the State House and on those days, I have to figure out how to look professional without completely hiding my personality. I love button-down shirts, especially J. Crew's silk versions. They're a blank canvas that can be dressed up with jewelry or a colorful tank peeking out underneath. Club Monaco has gorgeous work clothes- they have just enough detailing to be interesting and chic. And, almost all of my work pants are from Gap. They have a ton of different cuts and styles, and since they do great sales, I stock up! Yes! I shared on my blog that at my recent annual review, my boss commented on the obvious boost in confidence and happiness when I wear something I love. I was surprised that it made such a different in my work performance. Then again, if my boss knew how often I take a break to visit other blogs, she might disagree with me! Fashion has been one of three things I've loved my whole life (the other two are horror movies and animals). So I have this fear that if became a professional blogger, it'd suddenly turn into a burden and I'd lose my love of it. So for right now, blogging for personal pleasure and getting the chance to meet great people and occasionally write for other websites is more than enough to keep me happy. Is sleeping considered an outlet? I'm a big fan of it! [note: yes, yes it is] I do a lot of DIY's partially because I get so inspired by what I see other bloggers do and partially because DIY's leave more money for buying cat toys. I'm starting to get into running, too. You and Bianca are inspiring me! Honestly, between a full workday, exercising and multiple hours commuting, fitting in blogging can be hard. I try and get outfit photos before I leave for work and then I'll spend my lunch break writing up my posts. And really, I only post when I have something worth sharing. I'm loving the patterned pants/jeans trend and pajama style shirts. I need to add both to my closet, asap! 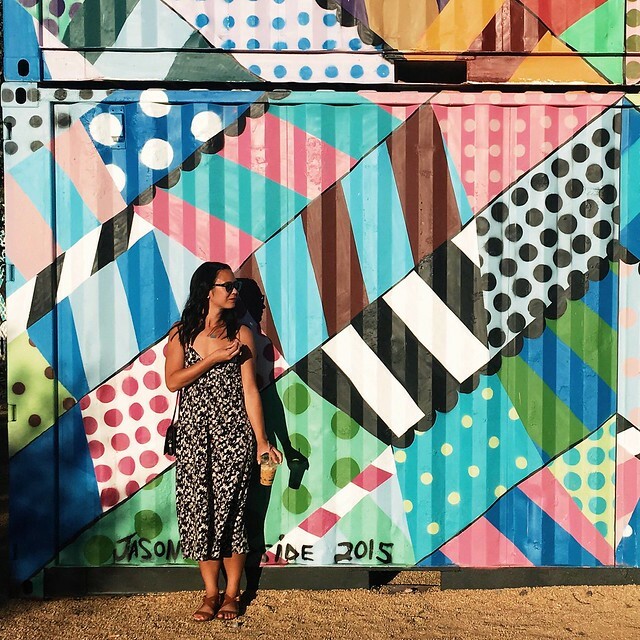 Make sure you head over to Shannon's blog to check out more of Najeema's outfit details! Love having days when you can wear a totally relaxed outfit plus days when you're forced to keep it more professional! And I LOVE Club Monaco-- so wish I could get all of my work clothes from there! Wow she's beautiful, has great style, plus seems very well-organized, which I envy. Hehe. LOVE Najeema. She's seriously the coolest!